The term "Sea Peoples" is a moder name given to various seaborne and land invaders, raiders and a loose confederation of clans who troubled the lands of the Near East and Egypt during the final period of the Bronze Age. Who these people were and were they come from, no one knows for certain. Though the Egyptians probably knew of the homeland of the Sea Peoples, the information has since been lost. Many attempts have been made to determine the origins of the various groups of Sea Peoples using textual and iconographic evidence, as well as the material culture of the Sea Peoples identified in Cyprus and the Levant. This materail culture is characterized foremost by locally made Achaean-style pottery; as such, a considerable Aegean presence has been argued in the multi-ethnic Sea Peoples coalition. Several scholars have puzzled over whether the Sea Peoples were responsible for the collapse of some of the Late Bronze Age civilizations or simply one of several catalysts that put that collapse in motion. For sure the Sea Peoples movement was one of the largest and most important migration in history which changed the face of the ancient world more than any other single event before the time of Alexander the Great. The earliest ethnic group later considered among the sea peoples is believed to be attested in Egyptian hieroglyphics on the "Byblos obelisk" (2000- 1700 BC) found in the Obelisk Temple at Byblos. The inscription mentions kwkwn son of rwqq, transliterated as Kukunnis, son of Lukka, (the Lycian). The next historical evidence of the Sea People is from the Amarna letters (*1), a unique corps of documents from the Egyptian New Kingdom. These documents represent the diplomatic correspondence between the pharaohs of the Amarna period and their contemporaries in Canaan, Mesopotamia, Anatolia and the Aegean. At this time, the Near East was dominated by a group of "Great King". There were also numerous city-states under the influence of the Great Kings which served as vassals to the Great Kings. It is in the vassal correspondence that the Sea Peoples appear most frequently. The earliest of the letters date from late reign of Amenhotep III, and the latest date from the reign of Ay spanning a period from 1386-1321 BC. The majority of the letters date to the reign of Akhenaten the monotheistic pharaoh. The ethnic group now classified as Sea Peoples mentioned in the Amarna letters are the Sherden, the Danuna and the Lukka. Some of the Sea peoples are also mentioned in the Ramesses II's Battle of Kadesh Inscriptions (*2). 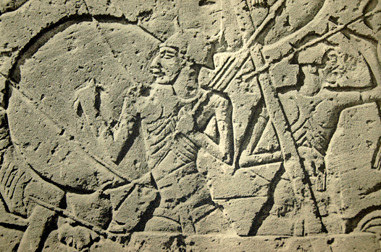 The battle with the Hittites at Kadesh was one of the most significant events of Ramesses' reign, it took place in his 5th years (about 1285 BC). Although it did not end in a victory for either side it did result in an alliance between Egypt and Khatti and a period of stability in the ancient Near East. The text is divided into two sections, a bulletin and a poem. Both of these were reproduced in the form of temple inscriptions and papyri. In the bulletin, Ramesses describes a massive confederation of peoples from Canaan and the Mediterranean working alongside the Hittites. Among them are two groups now classified as Sea Peoples: the Karkisha and the Lukka. Throughout the text, these two peoples are always mentioned in close association with one another. The poem gives a more detailed account of Ramesses' escape from the Hittite forces. Here the composition of the Hittite confederation is again described, and another Sea Peoples is mentioned in the context of Ramesses' own soldiers. 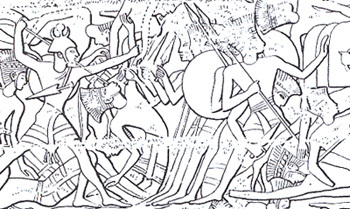 The Ramesses' forces included the Sharden captured in battle by the king and then put to work as mercenary troops. In the fifth year of Merneptah reign, (about 1207 BC) Egypt was attacked by a coalition of Labu (Libyans) and Sea Peoples at the border of the western Delta. These events are described in four texts (*3): the Great Karnak Inscription, the Cairo Column, the Athribis Stela, and the Hymn of Victory, otherwise known as the Israel Stela . According to these texts, King Meryey of the Libyans formed a coalition with several groups that are now classified as Sea Peoples, and, with wives, children and belongings, pushed forward into the Delta. As soon as Merneptah discovered what was happening, he led an expedition against the invaders and defeated them after six hours of fighting . The Sea Peoples are only mentioned in the first three of the texts: The Great Karnak Inscription is one of the longest known Egyptian temple inscriptions. The text begins with a list of the enemies faced by Egypt: the Libyans, Ekwesh, Teresh, Lukka, Sherden, and Shekelesh . The Meshwesh appear later in the text. The Ekwesh and Teresh, although traditionally grouped with the rest of the Sea Peoples, do not appear along with other Sea Peoples groups in earlier or later texts. The most important part of the text for a study of the Sea Peoples is the list of captives, killed enemies, and plunder towards the end of the text. The total number of enemies either killed or brought as living captives to Egypt is 9376. Most of these were Libyans, but the Sea Peoples groups also account for a large number of the dead. 222 Shekelesh, and 742 Teresh are accounted for, while the numbers have been lost for the Sherden and the Ekwesh. Interestingly, the Ekwesh are described as being without foreskins, a fact which may offer clues about their ethnic origins. The list of plunder is interesting for the information that it provides about the material culture of the Sea Peoples and Libyans. 9111 copper swords were plundered from the Meshwesh and Libyans, as well as cattle, goats, fine vessels, armor, and a variety of weapons. The Great Karnak inscription of the Pharaoh Merneptah also states that at least three of the Sea Peoples, the Ekwesh, Sheklesh and Sherden, were circumcised. It is interesting to note in any event, the biblical emphasis on the Philistines as uncircumcised and the fact that they are almost the only group so labeled in the biblical corpus suggest that they may have been the archetype of "uncircumcision" for the biblical authors. The historical text on the Cairo column is very short. It describes the announcement of a messenger to Merneptah of the invading Libyans and their allies: Year 5, second month of the third season (tenth month). One came to say to his majesty: "The wretched [chief] of Libya has invaded [with] --, being men and women, Shekelesh --" The Athribis Stela is similar to the Karnak Inscription. It consists of an abridged version of the battle account (also providing the year 5 date), followed by another list of slain enemies, captives, and battle spoil. The numbers agree with the other account overall, with only a few minor differences. The number of dead Sherden is again missing, but the number of Ekwesh is present: 2201. The most detailed and well known texts concerning the Sea Peoples is for sure the inscriptions from Medinet Habu (*4). It is a mortuary temple that was constructed for Ramesses III at Thebes, in Upper Egypt. The temple decoration consists of a series of reliefs and texts about the King's war campaign against the Libyans and the Sea Peoples. The texts and reliefs concerning the Sea Peoples date to year eight of Ramessess III's reign, about 1191 or 1184 BC. The inscriptions go on to specify the groups which were involved in the Sea Peoples confederation: Peleset, Tjekker, Shekelesh, Denyen and Weshesh (The hieroglyphics related to the land and sea battle do not mentioned the Sherden as part of the invaders, indeed in two of the Sea Peoples' ships the warriors wore the typical horned helmet of the Sherden). The Medinet Habu inscriptions are also significant for their artistic depictions of the Sea Peoples. These provide valuable information about the appearance and accoutrements of the various groups, and can lend clues towards deciphering their ethnic backgrounds. 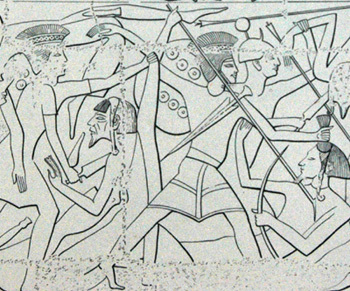 The land battle and sea battle scenes provide a wealth of information on the military styles of the Sea Peoples. 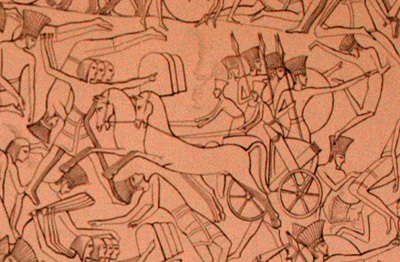 The reliefs depicting the land battle show Egyptian troops, chariots and auxiliaries fighting the enemy, who also used chariots, very similar in design to Egyptian chariots. 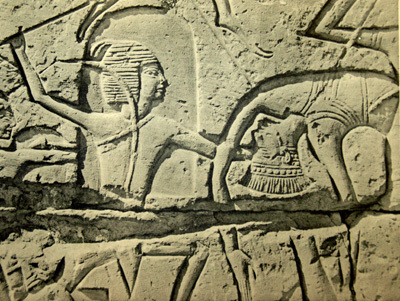 The other famous relief at Medinet Habu regarding the Sea Peoples is of the sea battle. 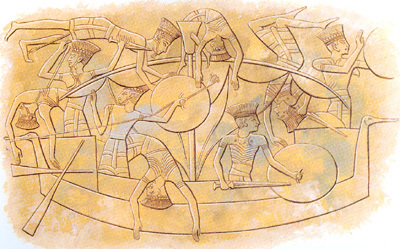 The sea battle scene is valuable for its depictions of the Sea Peoples' ships and their armaments. The Egyptians and the Sea Peoples both used sails as their main means of naval locomotion. 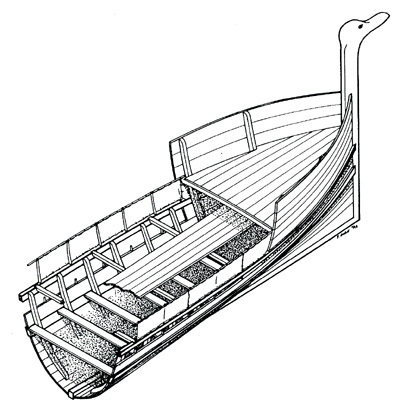 However, interestingly, the Sea Peoples' ships appear to have no oars, which could indicate new navigation techniques or more probably that the oars of the Sea Peoples are stowed. This could suggest that the Sea Peoples have been caught by surprise while they were stationed near the coast. Accompanying texts seem to allude to just such a situation �The countries which came from their isles in the midst of the sea, they advanced to Egypt, their hearts relying upon their arms. The net was made ready for them, to ensnare them. Entering stealthily into the harbor-mouth, they fell into it. Caught in their place, they were dispatched and their bodies stripped� Medinet Habu still remains the most important source for understanding the Sea Peoples, their possible origins, and their impact on the Mediterranean world. To this day, no other source has been discovered that provides as detailed an account of these groups, and this mortuary temple still provides the only absolute date for the Sea Peoples. . Some sea peoples appear in four letters found at Ugarit, the last three of which seem to foreshadow the destruction of the city around 1190 or 1180 BC. The letters are therefore dated to the early twelfth century. The last king of Ugarit was Ammurapi, or Hammurabi (about 1191�1182 BC), who, throughout this correspondence, is quite a young man. 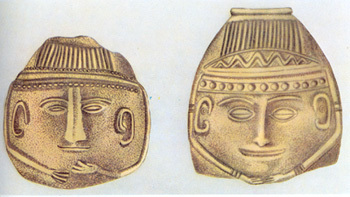 In the earliest letter "the Great King", of the Hittites, (presumably Suppiluliuma II) says that he ordered the king of Ugarit to send him Ibnadushu for questioning, but the king was too immature to respond. He therefore wants the prefect to send the man, whom he promises to return. What this language implies about the relationship of the Hittite empire to Ugarit is a matter for interpretation. Ibnadushu had been kidnapped by and had resided among a people of Shikala, probably the Shekelesh, "who lived on ships." The letter is generally interpreted as an interest in military intelligence by the king. The last three letters are a set from the Rap'anu Archive between a slightly older Ammurapi, now handling his own affairs, and Eshuwara, the grand supervisor of Alasiya. Evidently, Ammurapi had informed Eshuwara, that an enemy fleet of 20 ships had been spotted at sea. The Anastasi Papyrus (*5) is a satirical letter dating to the early Ramesside era (Late Bronze to Early Iron Age). The text survives in several copies of varying levels of completeness. One fragmentary copy of the text can be dated to the reign of Ramesses III. Since the name of Ramesses II appears in several passages, some scholars are inclined to date it to this Pharaoh's reign, at the earliest. The most important section of the text for our purposes is the part dealing with Amenemope's inability to manage a military expedition . Amenemope is sent to meet a contingent of foreign enemies at an uncertain location. The peoples that Amenemope must face are Sherden, Kehek, Meshwesh, and "Negroes" -- presumably Sudanese. Amenemope's assignment is to make provision for the campaign, which he fails to do. This section of the text tells us that the Sherden were fighting alongside the peoples of northern Africa as enemies of Egypt even at this early date, some time within the reign of Ramesses II. .
Ramesses III and the Sea Peoples are also mentioned in the Papyrus Harris I (*6) also known as the Great Harris Papyrus which with its 41 metres long, it is the longest papyrus ever found in Egypt. This document, dates to early in the reign of Ramesses IV, the successor of Ramesses III and found behind the Medinet Habu temple, suggests a wider campaign against the sea peoples, but does not mention the date. In it the persona of Ramesses III says: "I slew the Denyen (D'-yn-yw-n) in their isles" and "burned" the Tjeker and Peleset, implying a maritime raid of his own. He also captured some Sherden and Weshesh "of the sea" and settled them in Egypt. As he is called the "Ruler of Nine Bows" in the relief of the east side, these events probably happened in Year 8, his majesty would have used the victorious fleet for some punitive expeditions elsewhere in the Mediterranean. The Onomasticon of Amenemope, (*7 ) or Amenemipit (amen-em-apt) gives a slight credence to the idea that the Ramesside kings settled the Sea Peoples in Palestine. Dated to about 1100 BC, at the end of the 21st dynasty (which had numerous short-reigned pharaohs), it mentioned several different groups of Sea Peoples. The Meshwesh are associated with the Sherden, Kehek, and Nubians when they found a contingent of the Egyptian army before the reign of Ramesses II. By the time of Ramesses III they were a principal enemy of Egypt.After six place names, four of which were in Philistia, the scribe lists the Sherden , the Tjeker and the Peleset , who might be presumed to occupy those cities. The Story of Wenamun on a papyrus of the same cache also places the Tjeker in Dor (*8 ) at that time. The Danuna are only mentioned in the Onomastica in the time of Ramesses III. The Lukka are very closely associated with the Karkisa and also the Masa. They are listed as allies of the Hittites in the time of Ramesses II. Beautiful well preserved representation of captive Sea Peoples and other prisoners from Medinet Habu temple. 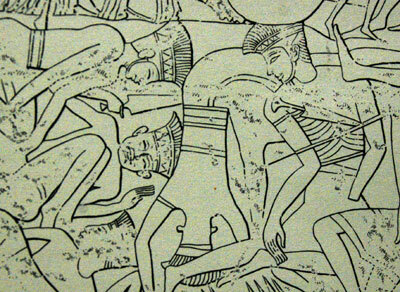 These prisoners are related to the Ramesses III Libyan and Asiatic war campaign. From left to right they can be identify as: Labu, Shekelesh, two possible Canaanite or Syrian and a Peleset. This scene is a clear example of how the Egyptian sculptures and reliefs were colorfull decorated. 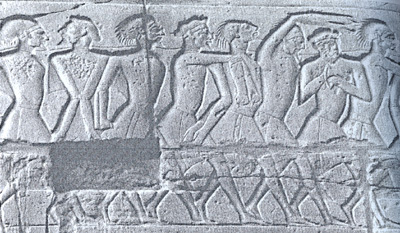 From the same Libyan and Asiatic war campaign there is another representation of captive Sea Peoples and other prisoners . From left to right they can be identify as: Unknown Asiatic prisoner, Meshwesh, a possible Canaanite or Syrian, unknown Asiatic prisoner, and a possible Shekelesh . 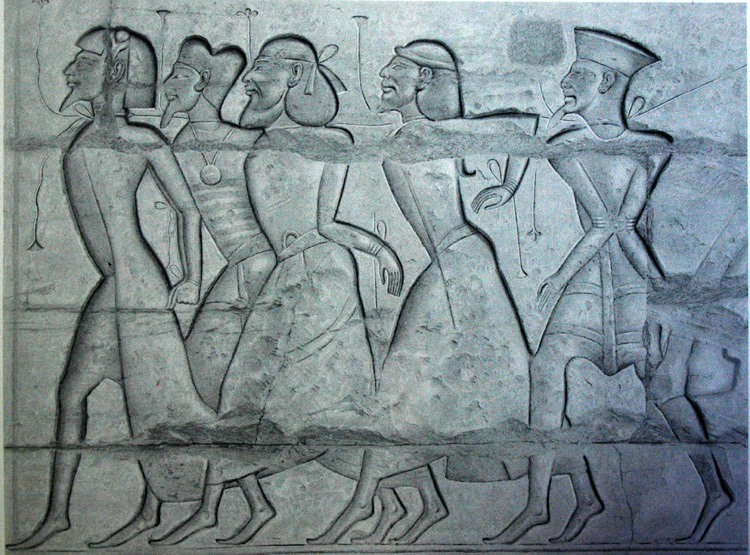 Other well preserved representation of captive Sea Peoples and other prisoners from Medinet Habu temple. These prisoner are related to the Ramesses III war campaign in Amor. From left to right they can be identify as: Meshwesh (or Labu), a possible Shekelesh, a possible Hittite/Chaldean, a Peleset and a possible Canaanite or Amorite warrior. Another interesting well preserved representation of captive Sea Peoples and other prisoners from Medinet Habu temple. These prisoner are related to the Ramesses III war campaign in Amor. From left to right they can be identify as: Labu, Unknown prisoner (possible Shasu), a possible Canaanite, Unknown Asiatic prisoner and a possible Denyen. Well preserved representation of captive Sea Peoples and other prisoners from Medinet Habu temple. Also these prisoner are related to the Ramesses III war campaign in Amor. From left to right they can be identify as: Labu, a Shekelesh , two possible Canaanite or Syrian warriors and a possible Denyen. 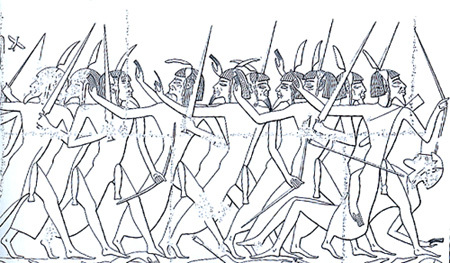 The Sherden were among the first of the peoples now categorized as "Sea Peoples" to appear in the historical record. The first appearance of people called Srdn-w occur in the Amarna letters (about 1350 BC), serving as part of an Egyptian garrison in Byblos, where they provided their services to the king, Rib Hadda. They appear again during the reign of Ramesses II, in the mid-13th century BC. In the Kadesh battle some of the Sherden were assimilated into Ramesses II own personal guard. The Sherden showed up in Egypt again during the reign of Merenptah, when they fought Egypt as part of a coalition of Sea Peoples , and again in the reign of Ramesses III, where they are well represented in the Medinet Habu reliefs as fighters alongside the Peleset. In these reliefs they are depicted both among the Sea Peoples and as allies of the Egyptians, as a mercenary troops for Ramesses III During the final period of the Bronze Age the Sherden appear in a list of Sea Peoples occupying the Phoenician Coast in a text dating from c. 1100 BC, the Onomasticon of Amenemope. The role that the Sherden played with relation to Egypt varies from one text to another. They appear as a contingent of the Egyptian army in a wide array of sources, including the battle inscriptions of Ramesses II, the Anastasi Papyrus, and the Papyrus Harris of Ramesses III, and as an enemy of the Egyptians for the first time under Ramesses II, in the Tanis and Aswan Stelae, dated to year 2 of Ramesses II ( about 1278 BC). Ultimately, they seem to have been mercenaries with no fixed alliances, who would fight either with or against Egypt . 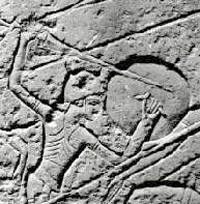 In this relief from Abydos (about 1280 BC) a Sherden skirmisher is cutting off the hand of a slain Hittite charioteer during the battle of Kadesh. 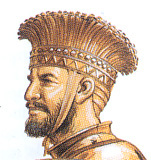 In this representation the Sherden warrior is equipped with a light tunic a medium size round shield and a simple low profile helmet with two horns and the central disk. 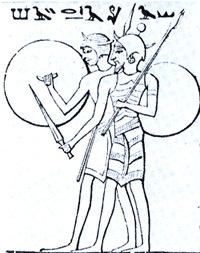 These two possible Sherden warriors represented in the "Sea battle" relief from Medinet Habu (about 1190 or 1180 BC) are depicted with medium size round shields handled by a central handgrip, helmet with two horns, a very long "rapier style" sword and "lobster style" cuirasses or corselets. This type of long sword shows closer similarity with specimens attested in the Aegean, Anatolian, Near Eastern areas and in the Sardinia Island. The sword above represented was more likely similar in shape to this specimen long 90 cm found at Beth Dagan near Jaffa dated about 2000 BC. This huge blade on analysis has been shown to consist of almost pure copper with a small addition of arsenic. A remarkable quantity (about 30) of similar swords date around 1600 BC have been also found in a cave grave near S. Iroxi in the Sardinia Island. 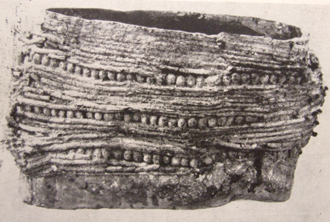 Also in this case the material composition was the same of the above mentioned specimen. Three example of Late Bronze Age swords found in Egypt which have not Egyptain origin and recall in general shape and design some of the ones handled by the Sea Peoples. A very interesting bronze sword has been found in Ugarit Syria. This sword is inscribed with the cartouche of Merneptah and it displays a general typological affinity with central European bronzework. However, features such as the grooved blade and the royal cartouche imply Near Eastern production based on a foreign model. 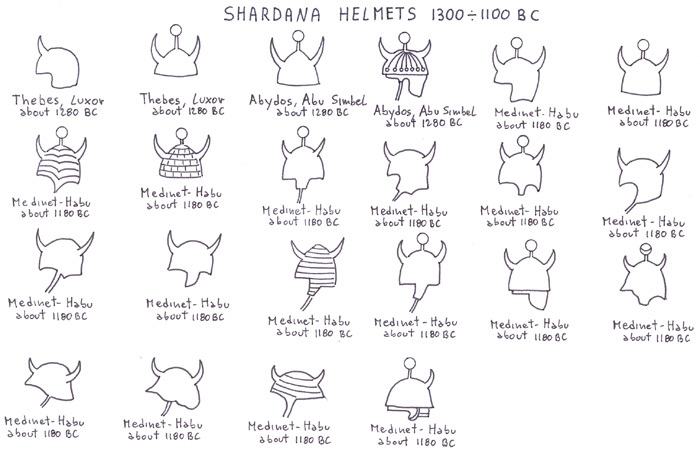 Several different types of possible Sherden's helmets are attested in the Egyptian reliefs in Luxor, Abu Simbel and Medinet Habu. These helmets seem to have had only horns when the Sherden are fighting against the Egyptians, being the central disk not added until after the Sea Peoples were defeated or recruit in the Pharaoh's army and therefore presumably connected with the Egyptian Sun God Re. These type of helmets show similarity with some Bronze Age/Early Iron Age Helmet representations attested in Aegean Area, Anatolia, Central/North Europe and Italy. In this well preserved representation of Sherden warrior from Luxor the bronze color of the helmet is still visible. 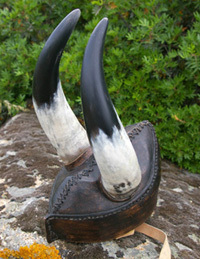 The horn is painted in light blue color so it was very likely made of different material like for instance ivory or tin or lead. Even if in the Medinet Habu inscription the presence of Sherden between the invaders groups of the Sea Peoples is not mentioned, the chief of the "Sherden of the sea" is represented between the prisoners. 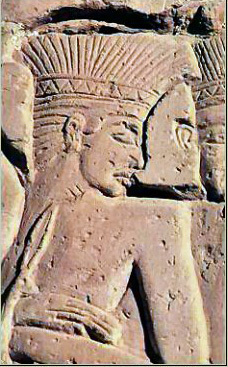 This image is very interesting being this captive Sherden wearing the horned helmet with the central disk which normally identify the Sherden warriors already recruit in the Pharaoh's army. 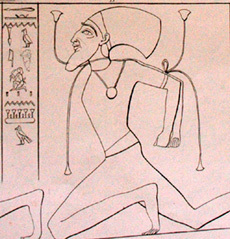 This image of Sherden chief closely resembles that of Semites as the Egyptians habitually portrayed them, and also suggests that Sherden were native to the East with its ancient Semitic population. 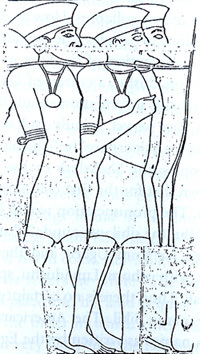 As already mentioned also the Sherden together the Ekwesh, and Sheklesh were circumcised as states in the Great Karnak inscription of the Pharaoh Merneptah. Of special importance in this relief from Medinet Habu is the portrayal among the Egyptian forces of a mixed group of mercenaries drawn from the Sea Peoples. 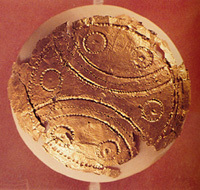 They include Sherden wearing disk-and-horns-topped helmets and probably the Peleset with their feather-topped helmets.In this rare relief, details remain of the small round shields of the Sherden with small round metal studs embroidered on the leather and wood of which the shield was more likely made. These shields and the bosses show similarity with the ones attested in some very Late Bronze Age Achaeans graves or represented on LH IIIC pottery. 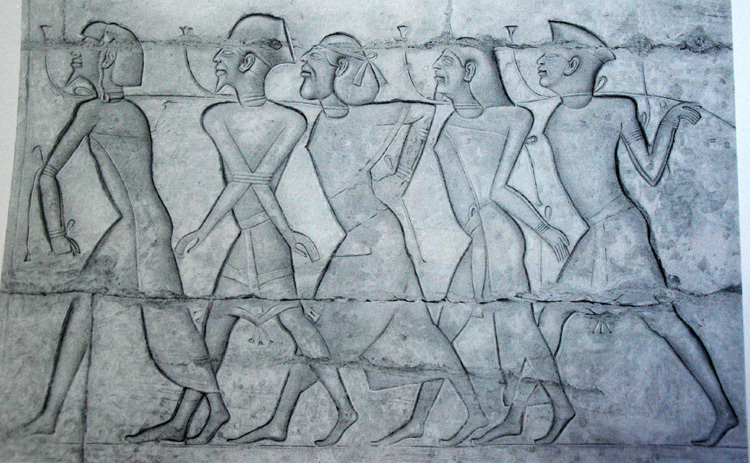 A group of Sherden mercenaries for Ramesses II are shown in this relief from Medinet Habu. They are equipped with light tunic, small shield with central handgrip, simple conical helmet with horns and disk and short sword or dagger. Also in this case the general shape of these daggers show correspondence with Bronze Age specimens attested in the Aegean, Anatolia and Near Eastern areas. The above represented daggers were more likely similar in shape to this specimen 30 cm long found in the Near Easter area dated about 2000 BC. Also for this blade the analysis has been shown to consist of almost pure copper with a small addition of arsenic. As already mentioned in the page dedicated to the swords, this kind of late Aegean Bronze Age swords (H Type) are attested in Pergamon Anatolia and in Greece mainland. 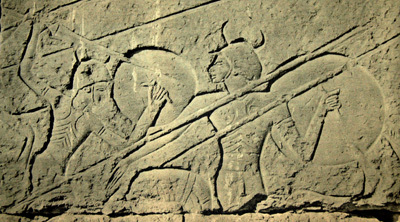 The left image shows two Sherden warriors equipped with large and medium size shields, bonnet like helmets, swords, and two javelins. Note the first warriors represented with beard, earings and what seems to be a light corselet with ribbons. The right images shows a possible Sherden wearing a " lobster style" cuirass, full head helmet and large round shield. The shield seems to be reinforced by two long elements placed on the inside, but looking better at the complete relief the two elements are very likely the ropes hanging from the ship sail. 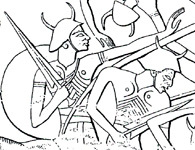 In the naval battle between the Sea Peoples and the Egyptian army of Ramesses III both the possible Sherden and Peleset ships are well represented. 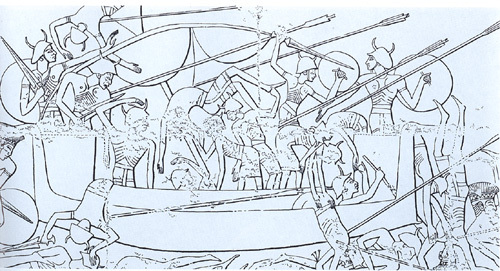 The Sea Peoples' vessels have no oars (or no oars have been represented by the artist) and only the sail is shown. They have a single mast with a crow's-net and high stern and prow terminating in duck-heads whose "bills" serve as battering device. The ships are steered by a large paddle. These type of vessels show close similarity with the ship depicted on a stirrup jar from Skyros, on a krater sherd from Tiryns both dated LH IIIC (see also the page dedicated to the ships) and some Central Europe Urnfield ornament representing double bird headed boats as well as Early Iron Age ship models from Sardinia. In this representation the possible Sherden are equiped with long swords, large and medium size round shield and " lobster style" cuirass. 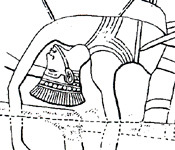 Several hypothesis have been made about the " lobster style" or ribbons cuirass and corselet of the Sea Peoples represented in the Medinet Habu relief in this case worn by the possible Sherden warriors. 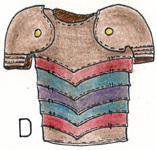 These have interpreted as full bronze armour, linen (or other perishable material) corselet or a cuirass made by a mix of metal and non metal elements. 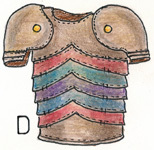 A) This full bronze armour is composed by chest and back plates, lower bands and shoulder/upper arm protections. 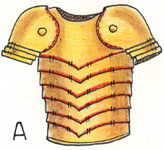 Its general design is based on some Achaean armour elements(see also the pages dedicated to the armour and corselet). 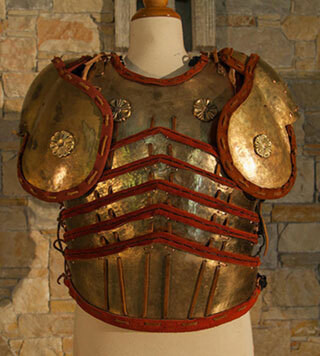 B) This bronze cuirass with chest/back plates and lower bands is worn over a linen or other perishable material kiton. 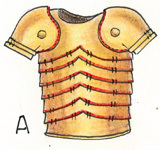 C) This composite cuirass is composed by a bronze chest and backplates, shoulder protection and quilted linen ribbons in the lower area. D) This other hypothesis shows a non metalic corselet probably made of leather, or other perishable material. A very interesting and fully functional bronze reconstruction of a possible segmental Late Bronze Age armour similar to the one worn by the Sherden has been made by Katsikis Dimitrios. A very interesting bronze mask dated 1400-1150 BC found in an unknow Near Estern area. Mask of this sort were also produced in pottery and they were possibly used as insets for large statues made of wood. 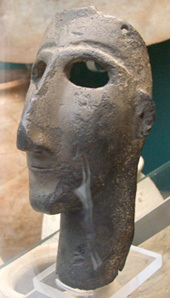 This example has two holes at the top on either side and it is possible that these held two horns, the resulting face representing that of a Sherden warrior. The general features of this mask remind the aspect of the warriors represented in the bronze statuettes from Sardinia. Having reviewed the history of Sherden in the Near East, a question remains to be answered: where did they come from? The Egyptian sources only inform us that they came overseas. Four main propositions have been put forward as to the origin of the Sherden: the region of Sardis in western Anatolia, East Semitic area, the Ionian coast, and the island of Sardinia in the central Mediterranean. The first one argued that, on the analogy of the fact that the original homeland of the Tyrsenians is traced back to Lydia by ancient authors, the Sherden are more likely to originate from western Anatolia as well, where the name of the capital of the Lydians, Sardis, and related toponyms like mount Sardena and the Sardanion plain and an ethnonym like Sardonians would be reminiscent of their presence. Accordingly, the Sherden were considered to be on their way from their original home in Lydia to their later home in Sardinia at the time of the upheavals of the Sea Peoples. In the case of the Sherden, however, the literary evidence from ancient authors to back up their eastern origin is absent: here this thesis rests upon nothing more than a likeness in names, which might be spurious. Evidence favour the second hypothesis is the dirk sword such as the Sherden used which is illustrated in cylinder seals of the East centuries before the first encounter of the Sherden with Egypt, and was among the weapons of the Hittite. What is known of the Aegean or Illirian does not suggest that they favored that sword. The dirk sword indicateds the East, the Semitic and Hurrian regions, as possible places of origin of the Sherden. Sherden personal name may support that origin. 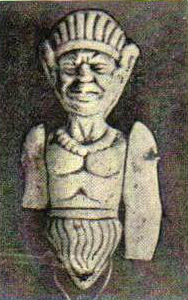 The father of the Sherden of the Ugarit table bears a Semitic name: Mut-Baal. Also the image of one captured Sherden chief represented in the Medinet Habu temple closely resembles that of Semites as the Egyptians habitually portrayed them, and also suggests that Sherden were native to the East with its ancient Semitic population. According to the third thesis the Sherden can be equated with the Sardonios or Sardanios of the classical era, a people from the Sardonia island (*9) In the 14th-13th centuries BC, the Sherden also had a reputations for the activities of other groups of Sea Peoples. However, this idea is tied to the theory that the primary factor in Late Bronze Age-Iron Age transition was massive pillaging and piracy on the part of certain groups in Aegean. 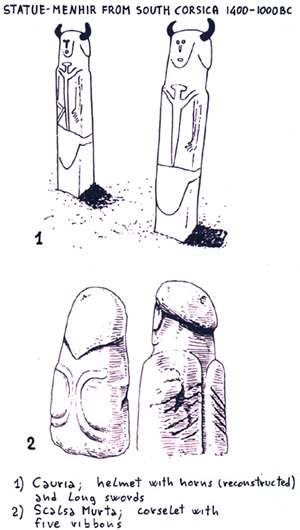 More revealing is the archaeological evidence presented for the forth theory which drew our attention to some similarities of the Egyptian depictions of Sherden with statue-menhirs from southern Corsica, depicting so-called Torre-builders, who are identical with the Nuraghe-builders from Sardinia. These entail: (1) the helmet with horns, the latter element of which can be reconstructed for some statue-menhirs on the basis of shallow holes once holding another material; (2) the corselet with five ribbons; and (3) the long sword. The statue-menhirs in question are assigned on the basis of C14 datings to the period between 1400 and 1000 BC, with a margin of error of 200 years. They give the impression of a society of which the members are proud of their martial qualities and hence excellently fit for service as mercenaries, in which capacity we encountered the Sherden in the Egyptian and Levantine sources. Furthermore several similarity with the Egyptian depictions of Sherden are also present in some of the XI to VI century BC bronze statuette attested in Sardinia as well as ships representation and some Bronze Age weapons found in the island settlements. Worthy to be mentioned is also a stele from the ancient Sardinia city of Nora where the word Srdn in Phoneicians symbols (dated between 9th and 8th century BC) seems to be the oldest so far attested in the west Mediterranean area. Even if on the basis of the combined evidence from Corsica and Sardinia, the one presenting the closest parallels for Sherden as depicted in the Egyptian memorials and the other furnishing evidence for contacts with the eastern Mediterranean during the later Bronze Age, it is difficult to to conclude if the Sherden originated from this part of the Central Mediterranean or their later move to this area at the time of the upheavals of the Sea Peoples. Indeed the fact that the Greek sources are agreed that the original name of the Sardinia island was Ichnussa, that the Sherden were circumcised and their image sometimes closely resembles that of Semites, makes the later hypothesis more reasonable. An awesome reconstruction of a Nuragic helmet made of leather and cow horns has been made by Alessandro Atzeni from Sardinia. The reproduction is based on some bronze statuettes of Nuragic warriors dated not earlier than the Final Bronze Age. Even if the general design of the cap is different from the ones represented in the Egyptian sources, this kind of horned helmet could had its origin from the ones worn by the Sherden. One of the most significant groups among the Sea Peoples who attacked Egypt in the fifth and eighth year of Ramesses III is the Peleset. This ethnonym, which has no earlier occurrence in the Egyptian sources, has been identified with the Biblical Philistines by Jean-Fran�ois Champollion soon after his decipherment of Egyptian hieroglyphic. Now, the Philistines are generally considered newcomers in the Levant, settling in their pentapolis consisting of the towns Asdod, Askelon, Gaza, Ekron, and Gath at the time of the upheavals of the Sea Peoples. In the Medinet Habu relief Ramesses III fights against the Peleset both in the sea and in the land battles. 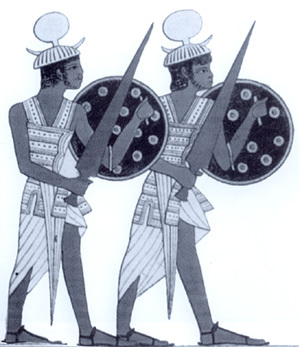 Indeed in the battles against the Lybians some warriors which may be identified as Peleset have been recruited (together the Sherden) in the Ramesses III army. In the Papyrus Harris, Ramesses III claims to have settled the vanquished Sea Peoples, among which our Peleset or Philistines, in strongholds bound in his name. This has induced some scholars to assume that the settlement of the Philistines in Canaan took place under Egyptian supervision. Furthermore, the continuity of Egyptian influence in the hinterland of the Philistine pentapolis might suggest to us that the Egyptian pharaoh maintained a nominal claim on the land conquered by the Philistines and considered them as vassals guarding his frontiers. After their settlement in Palestine, the Philistines rose to a position of power in the region owing to their military superiority over the local population, as exemplified by the famous engagement between David and Goliath � which the first mentioned miraculously won against all odds. 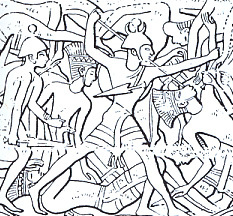 In the battle of Ramesses III against the Lybians both the Sherden and what seems to be the Peleset or the Denyen are fighting as mercenaries for the Faraoh's army. In this relief from Medinet Habu the Peleset or Denyen are represented with a medium size round shiled with several embossed elements on its surface. They are equipped with a light kiton, a long sword beared on the chest and a long spear. The helmet seems different from the typic "feathered" ones being its lower part similar to a rigid cap which covers the entire head including the ears. 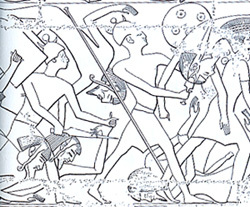 In the Ramesess III land battle representation from Medinet Habu relief the Peleset are shown fighting against the Sherden mercenaries. The Peleset are always represented with the " feathered " headdress and mostly of them are equipped with medium size round shield small sword or dagger and long spear. In the same land battle representation from Medinet Habu relief the Peleset are shown also fighting on six spooken wheeled Near East style chariots equipped with lateral quivers for bow and arrows. This representation is very interesting being the Peleset on chariots represented only armed with spears and shields like mostly of the Aegean charioteers instead of bow and arrows which were instead the typic weaponry of the Near Eastern charioteers. Interesting representation of a Peleset killed by an Egyptian warrior in the Medinet Habu temple relief. The Peleset is equipped with the typic "feathered" helmet with embossed ring and a V banded corselet which seems in this case made of fabric, linen or other soft material. This is the only Peleset shown in isolation and therefore can't be confused with other Sea Peoples. He is represented, together other prisoners, on the wall of the norther collonate at Medinet Habu. He seems to be represented with a different headdress than the typic "feathered" helmet. An iron spear point dated about 1150 BC has been found in Abydos where a group of Sea Peples was settled during the reign of Ramesses IV. Based on these elements this specimen is though to have belonged to the Sea Peoples. As recorded by the Bible. 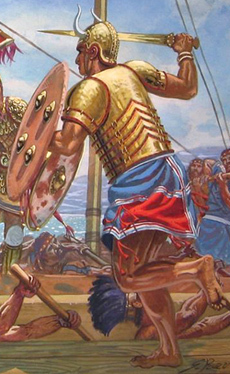 (*10) The military superiority of the Philistines was in fact based on their monopoly of iron production in the region. Several weapons dated around 1250-1150 BC have been also found in the cemetery at Tell Es-Sa 'Idiyeh. The presence of "double pithos" in the burials may indicate the presence of a group of the so-called Sea Peoples. Cronologically the Tell Es-Sa 'Idiyeh cemetery spans the transition between the Bronze and Iron Age and tools and weapons of both materials have been found in the greaves. The remains of textile (linen) in this javelin, indicate that objects had either been wrapped before deposition or had been incorporated into a tight binding around the deceased in the Egyptian manner. Very interesting Philistine-made decorated gold disc, Aegean in style from Ashdod dated around 1100-1000 BC. This is a possible sword's pommel cover. The typic Peleset helmet was the as called "feathered headdress". This helmet was probably made by leather trips or straw hold by a metal ring (see also the page dedicated to the late helmets). Indeed for some models the utilization of real feathers can't be excluded. During the Bronze Age and Early Iron Age this kind of headdress is attested from several locations in the Near East and East Mediterranean areas as well as Sardinia island. 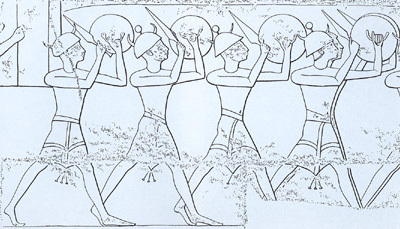 Other type of helmets worn by Sea Peoples, as represented in Egyptian reliefs: A) Peleset, B) Tjekker, C-D) Shekelesh, E) Denyen?, F-G-H-I) Shasu. In the naval battle between the Sea Peoples and the Egyptian army of Ramesses III the Peleset' ships are basically the same of the other seapeoples' ones. Also in this case the vessels have no oars (or no oars have been represented by the artist) and only the sail is shown. They have a single mast with a crow's-net and high stern and prow terminating in duck-heads whose "bills" serve as battering device. The ships are steered by a large paddle. 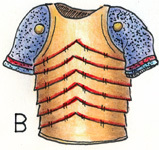 In this representation the Peleset are equiped with long swords, large size round shield and " lobster style" cuirass or corselet. Also in this case several hypothesis can made about one type of the " lobster style" or ribbons cuirass and corselet of the Sea Peoples represented in the Medinet Habu relief and identified as possible Peleset warriors. 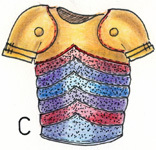 These have interpreted as full bronze armour, linen (or other perishable material) corselet or a cuirass made by a mix of metal and non metal elements. 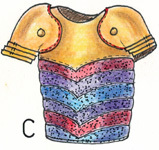 In this other representation a possible Peleset warrior worn a type of defence which seems to be a plain cuirass with shoulder guards and plate reinforcements between them. 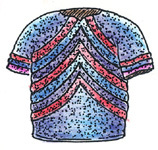 Its general design could be thus similar to some Achaean bronze armours attested or represented in Crete and Greek mainland (see also the pages dedicated to the armour and corselet). 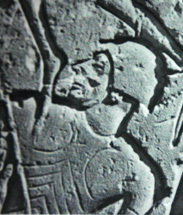 In this other representation a possible Peleset warrior worn a type of defence which seems to be very flexible and without sleeves or shoulder protections. This colud be interpreted as a light corselet made of quilted linen or other perishable material. 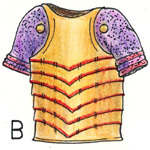 In another representation a possible Peleset warrior worn a type of defence which seems also very flexible and made with several small ribbons and sleeves. Also in this case it could be interpreted as a light corselet or short kiton made of quilted linen or other perishable material. In this representation of the land battle from Medinet Habu relief some of the Sea Peoples warriors (Peleset or Denyen or Weshesh) seem just wearing a sort of protective belts which could be made both of perishable material or bronze. Very interesting tentative isometric view of a Sea Peoples� ship made by F. M. Hocker. The main elements represented in this reconstruction derived from the dead bodies position on one of the Peleset� ship represented in the Medinet Habu relief. The presence of a bulwark protecting rowers, and the very closer similarity with the Aegean ships supports the fact that the Sea Peoples� ship actually had oarsmen and that they were not represented because the oars were stowed. A very exhaustive analysis of the Sea Peoples� ships has been made by Shelley Wachsmann of Institute of Nautical Archaeology, College Station (*10a). In this relief from Medinet Habu a captive Peleset is shown. This representation is very interesting being several of the original color well preserved. It also clearly shows one of the methods used by Egyptian army to binds the prisoners. The land of origin of the Peleset later identified as Philistines is obscure. There are many theories (Greece, Illyria, Crete, Western Anatolia, Lands to the East etc..), but there is no exact determination. Based on the reliefs at Medinet Habu and other sources, it seems reasonable to suggest that the Peleset (Philistines) did not reach Palestine directly from their original homes, but after a period of wandering in Asia Minor. One of the theories link the Peleset to the Homer Pelasgians who were allies of Troy, and one group of them lived in Thrace, northeast of Greece. Those Pelasgians would have migrated south, overrunning and fatally damaging Achaean Greek civilization. Shortly after, many would have gone farther south to Crete. In Odyssey Homer also tells of Pelasgians in Crete. Furthermore since many Biblical references (*11) refer to the Philistines origins as the Island of Caphtor, and since many scholars identify Caphtor with Crete, the idea more widely accepted is that the Peleset were originally Cretan. This theory is also well supported by the study of the pottery from Philistine sites which is closely related in ware, shape, paint and decorative concept to the one attested in Greece and Aegean islands of the LH IIIC period. The teory that the Peleset were originally Cretans has been somewhat strengthened by the discovery in Crete of the still un-deciphered Phaistos disk dated around 1700 BC. One of the signs in the disk shows the head of a man crowned with feathers-very similar to the feather-topped helmets of the Peleset depicted at Medinet Habu. 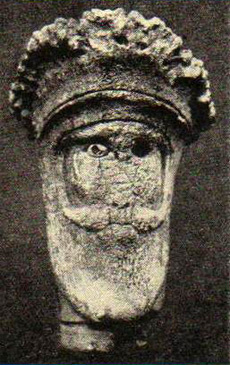 A very interesting representation of a bearded man with a possible feather-topped helmet probably dated around 13-12th Century BC is also attested in Crete. From Crete is this beautiful example of bronze bucket-shape cylindrical helmet found in the tholos tomb at Praisos-Foutoula dated around 1200 BC. A very interesting object is also this Egyptian caricature doll, probably representing a philistine with a feather-topped helmet, found in the island of Malta. There are several indications that the Peleset (Philistines) wandered in Asia Minor as for instance the typical feather-topped helmets of the Peleset recur in human-shaped coffins that have been discovered in several parts of Palestine. The adornments of the heads of the deceased molded on these clay coffins are again reminescent of the Medinet Habu relief. The minor individual differences in the decoration of the helmet-circles, notches, and zigzags- may have suggested different tribes or clans. The features on these grotesque coffins with their "calculated expressionism" which produced an effect of ",majestic calm, pride, and grave melancholy" had their parallel in the gold mask excavated in the royal tombs of Mycenae. After the Peleset and the Sherden, it appears that the Tjekker loomed largest in the thoughts of the Egyptians. 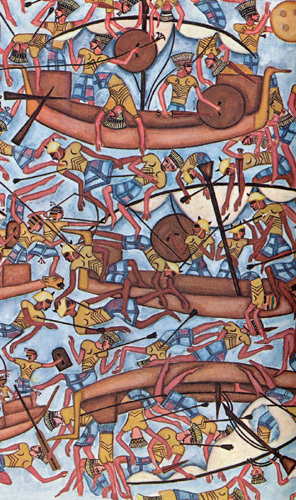 The Tjekker people took part in the battle against the Egyptians in year eight of Ramesses III. 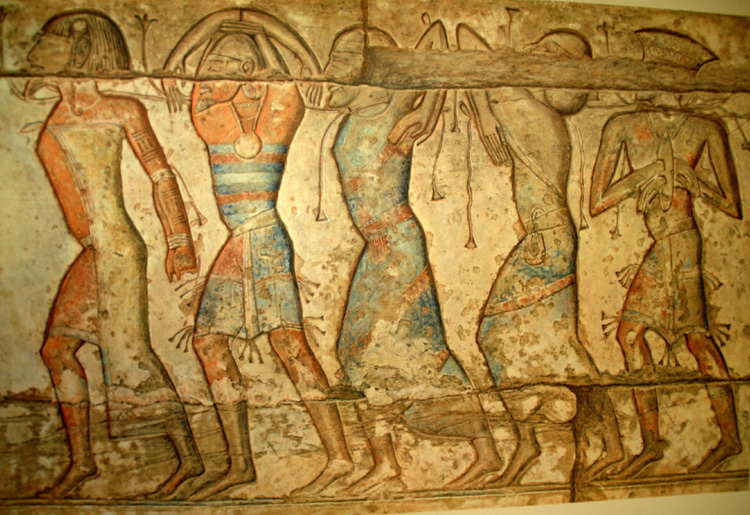 They, along with the Peleset, were a major group depicted in the reliefs at Medinet Habu, portraying the battle. 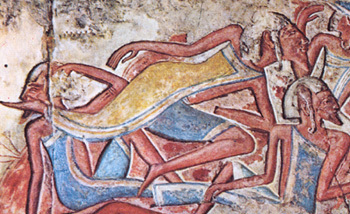 The Tjekker are also mentioned in the Wen-Amon story of the 11th century BC. The author recalls visiting the city of Dor, which he calls "�a town of the Tjekker�" in Dor, Wen-Amonis forced to deal with Beder, the rular of the city, about gold stolen from his ships. 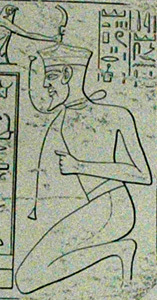 An individual identified as a Tjekker chief is illustrated in a Medinet Habu relief. He is bearded and wears a strange cap which remind even if un-crested some of the late Achaean helmets depicted on pottery as for instance on the side B of the famous warriors vase. The Tjekker warriors fight with short, straight swords, long spears, and rounded shields. Archaeological evidence from Dor supports Wen-Amon�s claim of Tjekker settlement. Stern�s excavations discovered quantities of Philistine style bi-chrome pottery on the site. In addition, the excavations found cow scapulae and bone-handled iron knives similar to those found at Philistine sites. Stern believes this is evidence of a Tjelkker, which he calls Sikel, settlement. The evidence may not prove a massive Sea People settlement, but does prove at least some presence at Dor. Some scholars trace the origins of this group of Sea Peoples in the Troad, the eastern coast region of Asia Minor. They connect the Tjekker with the Teucri people of the Troad, possibly having been displaced after the Trojan War. Sandars also suggests a connection to the hero Teucer, the traditional founder of Salamis on Cyprus. It is suggested that the Tjekker may have come to Cannan from Troad by way of Cyprus. 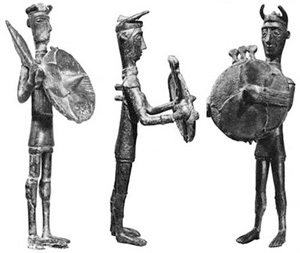 Some archaeological evidence in depictions of warriors found on Cyprus may suggest some connection or shared culture between the Tjekker, Anatolian and Aegean peoples. Although the evidence presented does not remove all doubt, some scholars point out that most of the evidence on the origins of the Tjekker people suggest they came from, or shared a culture with the people of the Aegean. The archaeological evidence leads to the conclusion that these people were not simply raiders, plundering established cities, but instead a group looking for a place to settle. Based on New Kingdom Egyptian text, the Denyen are considered one of the major groups of the Sea Peoples and they were outstanding seamen, and warriors. The Denyen are known from Egyptian, Hittite, and classical sources. In the historical sources, the Denyen are known by many different names such as Danuna, Danunites, Danaoi, Danaus, Danaids, Dene, Danai, Danaian. 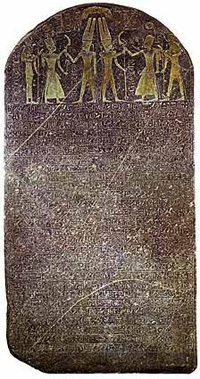 The earliest Egyptian text is the El-Amarna letters (mid 14th c. BC), which tells of Pharaoh Amenhotep IV's vassal, the king of the Phoenician City of Tyre, Abimilki. The el-Amarna letter (no. 151) tells of the king of Denyen�s death and that his brother became king and his land is at peace. The Denyen next appear during the reign of Ramesses III eighth year (about 1191 or 1184 BC) at his mortuary temple of Medinet Habu. The relief tells that their was a confederation of Peleset, Tjekker, Shelelesh, Denyen, and Weshesh that united to attack Egypt. The Denyen are also mentioned in the Papyrus Harris (where Ramesses III himself tell us about his victory over the Sea People), and in the text of the Onomasticon of Amenope which mentions the Dene and Gardiner suggests identifiying the Dene with the Danuna or Danaoi that may refer to a tribe living in the plain of Argos. There are several theories on where the Denyen came from: 1) Eastern Cilicia, 2) Mycenae, 3) Canaan. The first theory is that the Denyen came from Cilicia is based on the name of Adana, a city in the eastern part of Cilicia. Under the name Adaniya which, was named by Telepinus whose reign is now dated at 1525-1500 BC. According to Barnett, the Denyen lived in Cilicia in the ninth century BC, and caused alarm to their neighbors Amanus, Kalamu of Sam�al. 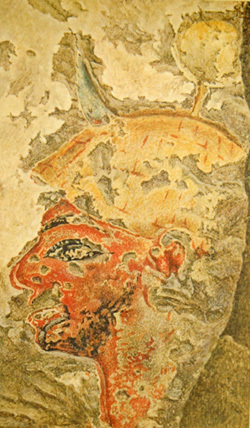 Not only the Denyen of el-Amarna, but the Dan of the Egyptian sources as well were the inhabitants of the Cilician Adana, without any connection with Greece. The "islands" where Ramesses III situated the Denyen were tiny islets and capes of the Cilician coast . The Denyen are also known from the Karatepe inscription, which mentions the legendary Greek hero named Mopsus. Mopsus is said to have found Aspendos, which is identical to the town, that Azitawadda in Cilicia. The event according to the Greeks are supposed to happen after the fall of Troy in 1180 BC. A second theory associated with the Achaean world equating the Denyen with the Danaoi from mainland Greece. Many scholars associate the Denyen with the Greeks because all Greeks were referred to as Danaans by Homer. The fact that Homer lends the name Danaans to the Achaeans is a credible suggestion because the Danaans came from Mycenae. Greek tradition suggests that the Danaoi settled in Argos and were named after the Danaos. The third theory that suggest the Denyen origins come from Canaan. The Denyen and other Sea Peoples return to the Levant as a counter migration. While many of the Denyen, went to the Aegean and Mycenae and became known as the Danaans. 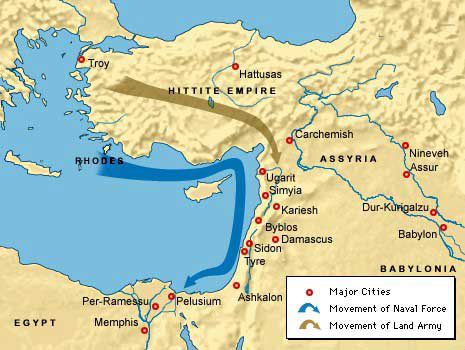 Others went to Asia Minor and some of the Sea Peoples return to the Levant. The Denyen were accepted into the confederation of the tribes of Israel called Dan. The Denyen were part of a confederation in the Levant with other groups of Sea People especially the Peleset. 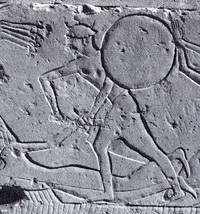 They were part of the sea battle against the Egyptians, which is depicted on the relief at Medinet Habu. The Biblical data shows that at a certain stage of its settlement the Tribe of Dan was very close to the People of the Sea. From the historical and mythological sources, it is possible to ascertain the following facts. The tribe of the Danai originated in the east, and the introduction of the alphabet to Greece is attributed to it. Its members were outstanding seamen who had special connection with sun worship. The association with the Tribe of Dan is because their was two different tribes (the Danites and the Danai) with identical names and similar characteristics which operated in the same geographical region and period or there is a link between the tribe of Dan and the tribe of Danai, and possibly a certain measure of identity. In conclusion, although the Denyen are known from many different sources, they were a major part of the confederation that attacked Egypt with the other group of Sea People. The origins of the Denyen are many and very unclear. More likely the Denyen were coming from the island Cilicia because many of the text are from that region. The reliefs and inscriptions at Medinet Habu are the most famous and well-known source for references to the Sea Peoples. The annals here give the most detailed account of the Sea Peoples, but only mention the Shekelesh briefly. However we are able to get a glimpse of what a Shekelesh soldier would have looked like and what accoutrements accompanied him into battle. Of the others, the Shekelesh (and the Teresh) wear cloth headdresses and a medallion on their breasts, and carry two spears and a round shield; their place of origin has been considered to be Sagalassos in Pisidia. Some scholars, such as N.K. Sandars, believe that the Shekelesh came from southeast Sicily. Indeed from other sources we learn that the "Sikeloy" were not the original inhabitants of Sicily, but migrated there from peninsular Italy. In the 8th century Greek colonists came across a group of people known as the Sikels on the island, which they believed had come from Italy after the Trojan War. Although not much is known about the Shekelesh, it is clear that they were an important element in the invasion of the Sea Peoples and played an important role in the military conquests of the coalition.I view this group as a strong and proud group of people, despite the fact that they are a more or less obscure group, mentioned infrequently in ancient texts. Because the Medinet Habu inscription related to the sea battle only mentioned the Peleset the Weshesh (normally associated with the feathered or reed helmet) and Sheklesh some Scholars suggest that the warriors with horned helmets normally identified with the Sherden could instead have been the Sheklesh . They also suggest that the Sherden are probably the ones only represented with the horned helmets but incorporating the central disk or knob. The tribe of Sea Peoples known as the Meshwesh rose to prominence during the reign of Ramesses III in Egypt. Some of the first references to this group appear in the Medinet Habu inscriptions, the Harris Papyrus and the Anastasi Papyrus. 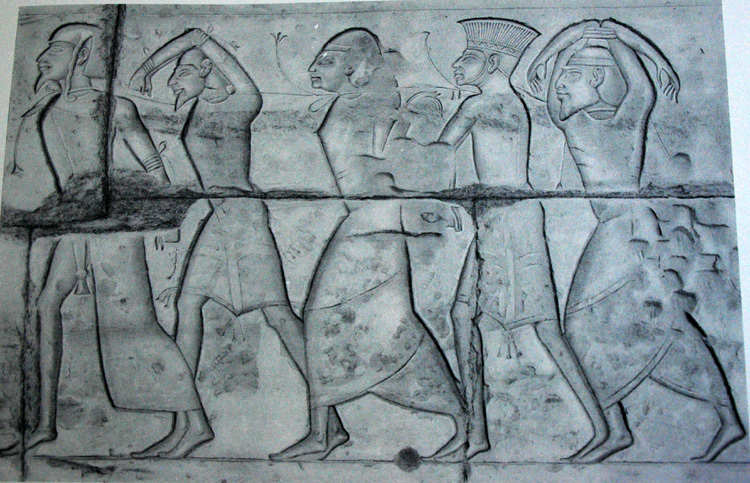 They are also depicted in several reliefs detailing the battles the Egyptians fought against the Sea Peoples. During the recurring, incessant border wars of the time, the Meshwesh first appeared as kindred tribes of the Tehenu and Temehu, but began to play increasingly substantial roles in the later campaigns. In 1182 BC, Egypt was under threat from an alliance between the Libyans and the Meshwesh -who possibly also coordinated an attack with the Peleset and the Tjekker. Even if it is not certain many Labu (Lybians) who wore the phallus sheath may have been Meshwesh. Following Ramesses III�s victory in the second Libyan war, the Meshwesh were left with enough strength and numbers to become Egypt�s chief opponent for the remainder of the conflict. Another historical record of the Meshwesh comes from inscriptions found at Karnak from Merneptah�s victory in Libya during the fifth year of his reign�when he fought against an army composed of the Libyans, Meshwesh, and other northern sea-borne forces. The Meshwesh are again found in the Classical writings of Herodotus, over a thousand years later. He refers to this group of peoples as the "Maxyes", and offers the most physical description outside of the pictorial reliefs. Herodotus describes their semi-barbaric hairstyle�consisting of shaving one side of the head while leaving the other�and the fact that they paint their bodies and lay claim to Trojan heritage. He goes on to talk about the land from which they came (eastern Libya), all the while making sure to guard himself by saying that he cannot vouch for any of these statements, he is merely passing along what he himself has heard. These are the two major sources for description, both physical and cultural, for the Meshwesh. They are initially identified in Egyptian battle records as having fought alongside the Libyans and their allies, but also recognized as having risen to their own respective seat of power following these skirmishes. The fact that they are again specifically singled out by Herodotus in his Histories serves notice to the fact that they were indeed a significant socio-political entity in the Eastern Mediterranean at this time. This tribe from which the land of Libya takes its name is sometimes called the Labu, Libu, or Rebu, and appears in many Egyptian texts, such as the inscriptions on the temple at Medinet Habu. The earliest of these texts is the Papyrus Anastasi II in Dynasty XVIII and appear in texts, if only rarely, up until Dynasty XXI. It is unclear for certain where the Labu originated, but they may have originated from west of the region of Libya. It is clear, however, that along with other tribes such as the Meshwesh they replaced the pervious inhabitants of Libya at some time during the New Kingdom. If the Labu are from the west of Libya, then it seems strange to associate them so closely with the Sea Peoples, even if the Labu do fight alongside the Sea Peoples against the Egyptians. Another theory, though, is that the Libu originated in the Balkans and were driven to migration by the Illyrians, with the Libu finally settling in Libya. The other Sea Peoples are generally thought to have originated in the Aegean, in the case of the Peleset, or in Anatolia, in the case of many of the other Sea Peoples tribes. The Labu are characterized by a number of features when they are depicted in Egyptian reliefs, such as fair skin, red hair, and blue eyes. They also wore ornamental cloaks, had one lock of hair, and were tattooed on their arms and legs. Some of these characteristics the Labu also shared with the Meshwesh, but unlike the Meshwesh the Labu wore kilts instead of loincloths. But the Labu were by far more documented for their wars against the Egyptians than for their looks. We see one of these campaigns documented in the "Israel Stela" of the fifth year of Merneptah�s reign, in which Merey, the chief of the Labu, has led his people along with other tribes against the Egyptians, and Merey and his troops were defeated. It has been suggested that the Labu fought against the Egyptians during the reign of Merneptah because there was no food. This seems like a reasonable explanation since we know that during the politically troubled years in Egypt after the reign of Merneptah, both the Labu and the Meshwesh took the opportunity and settled in western Egypt as far as the west bank of the Nile. Then, during the reign of Ramesses III, the Labu attacked Egypt because the pharaoh refused to give back one of the Labu chief�s children, but the Labu were defeated, which is documented in the Papyrus Harris (*12). The end of the Labu people seems to be as much a mystery as their origins are because there are two differing viewpoints concerning their end. Redford says that the Libyans were no longer a menace after the aforementioned battle with Ramesses III, whereas Gardiner says that the Libu were still a problem for the Egyptians at least up until the reign of Ramesses X. There is no evidence from either author as to why there is such a substantial difference in time regarding the end of the Labu people. Scholars generally accept that the name Ekwesh or Akwasha is the Egyptian equivalent of Achaean and Ahhiyawa of the Hittite text. If that is valid, the Bronze Age Greeks are to be recognized as one of the Sea Peoples. According to the best reading of the numbers inscribed at Karnak, there were 1213 Ekwesh casualties, and they were the largest group among the Sea Peoples, the core of this Sea People force. Further, the Karnak inscriptions clearly imply that the Akwash or Ekwesh were circumcised. Hardly anyone thinks that the Greeks of the Bronze Age were circumcised, but of course, no one really Knows. It is certainly possible that the Ekwesh were the Achaeans, but which Achaeans? Not only were there Achaeans on the mainland, but also in Crete and on the Anatolian coast and the island of Rhodes just offshore. In their settlements on the Anatolian coast, the Achaeans were neighbors of the Lukka, and they might have allied with Lukka in various ventures. Legends preserved by the Greeks remember close contacts with the Lukka or Lycians. It is thus believable that Achaeans from the Anatolian coast could have been caught up with their Lukka neighbors in events, whatever they may have been, which impelled them to sail for the coast of Libya or Egypt. A possible reference that the Achaeans were among the Egypt attackers is from the Odyssey (*13) but of course it is not known if this preserves a memory of the invasion of Egypt during the reign of Merneptah, or of other raids on Egypt by Greeks of the Bronze Age or Early Iron Age. The Teresh or Tursha are mentioned during the fifth year of Merneptah reign, (about 1207 BC), in the Great Karnak Inscription, between the enemies coalition faced by Egypt. In this document a total of 742 dead Teresh are accounted. 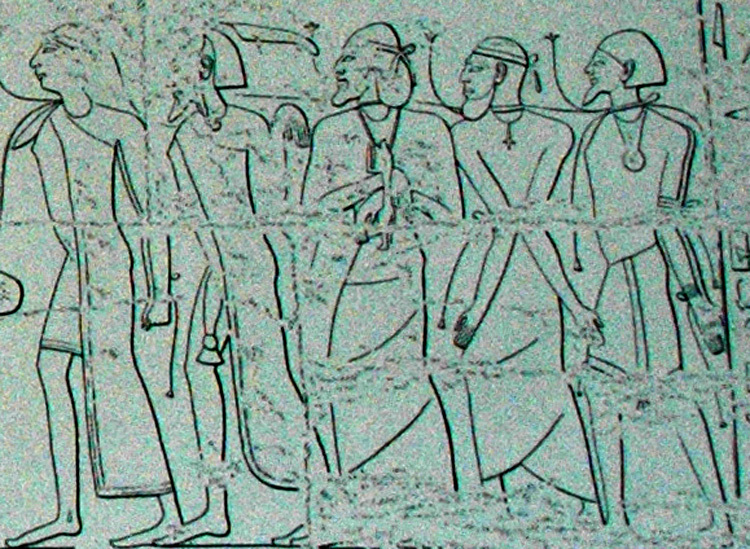 During the reign of Ramesses III a Teresh chief is shown together other captive Sea Peoples in the Medinet Habu relief. Furthermore in the tomb 23 from Gurob the Archaeologist W. Flinders Petrie found the mummy of An-en-Tursha. He was a Teresh butler in the court of Rameses III. This well preserved mummy still shows fair hairs thus his origins was not from Egypt, Africa or Asia. Several possibilities exist which may identify the Teresh as Anatolians. First to be considered are the Trojans. Troy appears in a Hittite record as Taruisa (see also the page dedicated to the Trojan war) It is reasonable assumption that the people of Taruisa called themselves by some name close to this. Stripped of vowels so that it can be compared to the stripped Egyptian spelling. 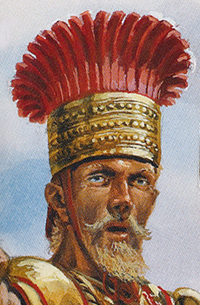 The period of the attack of this Sea peoples coalition it is compatible with some of the war actions occurred in the Troy area, so many Trojan refugees could be expected, and some would attempt to survive by living by their wits and their swords. The second possibility is relevant to the Tyrsenians a group of pirates with well decked ships mentioned in two works of about 700 BC in a poem known as Hymn to Dionysus, which tradition attributes to Homer. During the classical period Herodotus and Thucydides mention them under the name Tyrrhenians. Herodotus places these peoples in Lydia. Thucydides remarks that they were known to live on the island of Lesbos, offshore from Lydia. Lydia is the Classical period name for the land which in the Bronze Age was Arzawa, and possibly part of Seha River Land an area located in the near south of Taruisa. Some scholars suggested that the Tyrsenians may be related to the Etruscans in fact the Tyrhennian Sea - derived from a Greek term - still survives as a name for the waters between Tuscany and Corsica. Beyond that, note that the Etruscan word for themselves was Rasena (*14). The third possibility shifts the geographic focus to the southeast coast of Anatolia. In a Hittite record containing a list of cities the names Kummanni, Zunnahara, Adaniya, Tarsa... appear together. These last two are more likely the cities of Adana and Tarsus, and thus is certain that the city of Tarsus was in existence in the Bronze Age. If the Egyptians were to ask a man of Tarsus where he came from, he might point in northerly direction and answer "from Tarsa" or "Tarsha" or "Tarssas" This answer would be written down by Egyptians as T-r-s or T-r-sh. Tarsus is close to the coast, and in later times an important port furthermore it is not a great distance from the coast of Lukka and there were probably frequent contact between these peoples. The Karkisa appear to be one of the minor tribes of sea peoples mentioned in ancient literature. In most of their ancient references they are mentioned only in passing, and in many of their references it is unclear whether they are referred to as a group of people or as a geographical region. The first mentions of the Karkisa occur during the reigns of Ramesses II of Egypt and Muwatullis of the Hittite Empire. Both of these emperors mention the Karkisa. Ramesses mentions the Karkisa in his inscriptions regarding the battle of Kadesh. In both the Bulletin and the Poem about the battle of Kadesh, the Karkisa are mentioned as a tribe that has joined forces with the Hittites. The name Karkisa appears only in lists and no particular detail is given to the tribe. The Hittite record of the Karkisa reinforces the idea that the Hittites and Karkisa were allied at the time. In the annals of Mursilis, he mentions a person whom he sent to the people of Karkisa. Muwatullis paid the Karkisa to protect this man from his own brothers. The man then sided with an enemy of Muwatullis, and was recaptured. He now begs for vassalage from the Hittite emperor. In this story the Karkisa are represented as an ally of the Hittites, which fits their description by Ramesses II. The Karkisa make one final appearance in ancient literature. In the Onamasticon of Amenope, the Karkisa are mentioned in reference to the Lukka. This reference is only geographical in nature and does not mention anything aside from the location of the people. The geographical location of the Karkisa people is based on their relation to the land of the Lukka. 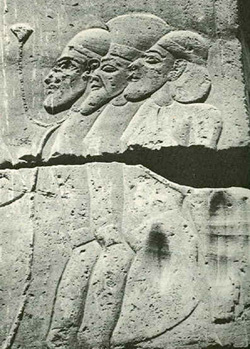 Some scholars places the Karkisa in southwest Asia Minor, Barnett mentions specifically that the Karkisa are associated with the Hittite area of Caria, which is on the south-western tip of Anatolia. The Lukka are a people that are mentioned in some ancient texts, but rarely found in more than just a list. From Pritchard, a translation is given of a Hittite prayer. In this prayer the Hittites say "Lukka country" and tell how they denounce the Hittite deities. Egyptian texts from Ramesses II and Merneptah, have poems from the Battle of Kadesh and the Great Karnak Inscriptions. These both brag about the greatness of the pharaoh over the smaller attacking peoples, like the Lukka. There is no clear evidence of where exactly the Lukka (Lycians) lands were but scholars have proposed some possibilities. One theory is that the Lukka resided in western Anatolia, in western Caria. According to the Ugarit tablets, there are writings form the Ugarit king to the king of Alasyia, stating that he will send a fleet to the coast of Lukka to defend the pass from the Aegean to the Mediterranean. Their territory went to the coast, but it�s unclear if it�s the Aegean or Mediterranean coast. These Lukka lands are also referred to as the Xanthos Valley. The Lycians had a series of kingdoms, called Arzawa lands, which were run by the Hittites. These kingdoms had no real political power though, for there is no evidence of any treaties with the Hittites, nor is any Lukka king named . 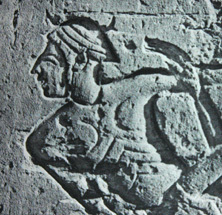 According to Hittite texts the Lukka were a rebellious people and easily swayed by foreign influences. These Hittite texts state that the Lukka are sea-goers. They made yearly attacks on the King of Alasiya and his lands by sea, and did so effectively, and so were considered pirates in this way. The Amarna letters gives us an example of a letter from the Alasiyan king to the Pharaoh Akhenaton. These letters ask for Egyptian aid, and were also written to re-assure Akhenaton that they were not siding with these Lukka people. During the mid 15th century, early in the New Kingdom, Lukka was part of an alliance against the Hittites with 22 other countries, called the Assuwan Confederacy, but were defeated by the Hittite king, Tudhaliya I. In a Hittite prayer, the Lukka are referred to as denouncing the Hittite sun goddess of Arinna . In this same prayer, the Lukka are said to be attacking the Hatti land, along with other peoples, and to be destroying it . These examples just further prove that the Lukka were in the area and were attacking lands and had some sort of power. Egyptian sources too mention the Lukka peoples. From the time of Ramesses II, a poem from the battle of Kadesh, mentions the Lukka as being an ally of the defeated prince of Kheta. Another text that gives a more descriptive view of the Lukka comes from the reign of Merneptah, and his Great Karnak Inscription. It accounts his fifth year of reign, in 1208 BC, when a Libyan King, Meryre, attacked the western Delta. This Libyan king brought with him a large army, which included the Lukka people. The actual inscription tells about Merneptah�s great victory over these invaders who were attacking Egypt. There are numbers given to the casualties of this battle, and the supposed number is 200 for the Lukka, which is very small in comparison to the 6,539 Libyans killed. The Lukka were seen as a part of a northern sea-borne alliance with the Libyans. Barnett notes that though there are many drawing inscriptions of Sea Peoples�, that none exist of the Lukka. The Great Karnak inscription also notes that these sea peoples brought families over with them, giving a sense that these people didn�t just come over to attack but to stay. The Lukka had their own language, which probably was a descendant of Luwian and related to Hittite, with some Greek influence in the letter forms and sound. The language only lasted 170 years, from 500BC to 330BC. It is thought that the language died because of the more commonly used Greek and Aramaic, many inscriptions from the Lukka are found written in these tongues too. There are very few Lukka inscriptions, and are only found on stone, coins, graffiti or inscriptions on ceramic and metal artifacts. Scholars believe that only certain specialists could write. Many of the burials found have Very specific instructions on them. They list such things as who can be buried here, who the tomb owner is, how violators would be punished if they tried to bury someone who didn�t belong, and more. The Lukka didn�t seem to have a distinct area to themselves, but were mainly in western Anatolia. They were scatterers too, going into another areas of Anatolia, and over time broke down the rule of the Hittites, due to numerous raids just warring down the system. The Weshesh were part of a combined force of Sea Peoples which attacked Egypt during the reign of Ramesses III. The Medinet Habu inscription attested "They were coming forward toward Egypt, while the flame was prepared before them. Their confederation was the Peleset, Tjeker, Shekelesh, Denyen and Weshesh, lands united. They laid their hands upon the land as far as the circuit of the earth, their hearts confident and trusting: Our plans will succeed!... "The Sea peoples did not learn any lessons from this defeat, as they repeated their mistake in the Year 8 with a similar result. The campaign is recorded more extensively on the inner northwest panel of the first court. It is possible but not generally believed that the dates are only those of the inscriptions and both refer to the same campaign. 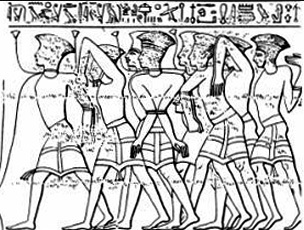 In Ramesses' Year 8, the Nine Bows appear again as a "conspiracy in their isles." This time they are revealed unquestionably as sea peoples: the Peleset, Tjeker, Shekelesh, Denyen and Weshesh, which are classified as "foreign countries" in the inscription. They camped in Amor and sent a fleet to the Nile. The campaign of the Year 12 is attested by the Sudstele found on the south side of the temple. It mentions the Tjeker, Peleset, Denyen, Weshesh and Shekelesh. Furthermore the Weshesh together other sea peoples are mentioned in the Papyrus Harris I which suggests a wider campaign against the sea peoples, but does not mention the date. In it the persona of Ramesses III says: "I slew the Denyen in their isles and burned the Tjeker and Peleset...", implying a maritime raid of his own. He also captured some Sherden and Weshesh of the sea and settled them in Egypt. As he is called the "Ruler of Nine Bows" in the relief of the east side, these events probably happened in Year 8; i.e., his majesty would have used the victorious fleet for some punitive expeditions elsewhere in the Mediterranean.Little is known about the Weshesh, though even here there is a tenuous link to Troy. As already mentioned, the Greeks sometimes referred to the city of Troy as Ilios, but this may have evolved from the Hittite name for the region, Wilusa, via the intermediate form Wilios. If the people called Weshesh by the Egyptians were indeed the Wilusans, as has been speculated, then they may have included some genuine Trojans, though this is an extremely tenuous association. Some scholars associate the Weshesh with Iasos or Assos or Issos in Asia Minor, or to Karkissa (Caria). Some have theorized that they, like the Denyen, became part of the Israelite confederacy (as the tribe of Asher). The Tribe of Asher is one of the Hebrew tribes of Israel, founded by Asher the eighth son of Jacob. 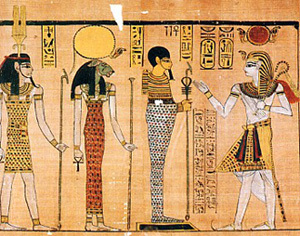 Asher, his four sons and a daughter, settled in Egypt. The tribe may be the same as the Weshesh mentioned in Egyptian accounts (the W of Weshesh is a modern invention for ease of pronunciation, the egyptian records containing mention of the group refer to Uashesh). The Weshesh were thus part of a tribal confederation, which also included Peleset (the Philistines), Danua (possibly Dan), Tjekker (thought to mean of Acco, and thus may refer to Manessah), Shekelesh (thought to mean men of Sheker, and thus may refer to Issachar). The Canaanites even if can't be considered part of the Sea Peoples coalition are often mentioned in the Egyptian text sometimes also associated with the sea peoples. A very well preserved and colorful representation of a probable Canaanite and other Syrian captive peoples is from the relief of Medinet Habu. 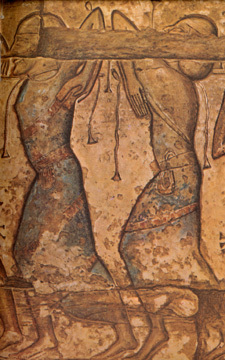 In this images the Canaanite is wearing a " Sea Peoples" style kilt with a corselet made of several (linen?) colorful bands. He is also wearing a medalion similar to the one of the Tjekker and a simple cap. The other "Syrian" warrior behind him is wearing a decorated long tunic and a bandana. 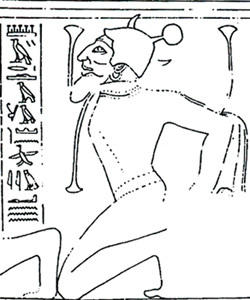 References to Canaanites are also found throughout the Amarna letters of Pharaoh Akenaton about 1350 BC, and a reference to the "land of Canaan" is found on the statue of Idrimi of Alalakh in modern Syria. After a popular uprising against his rule, Idrimi was forced into exile with his mother's relatives to seek refuge in "the land of Canaan", where he stayed, preparing for an eventual attack to recover his city. Texts from Ugarit also refer to an individual Canaanite (kn'ny), suggesting that the people of Ugarit, contrary to much modern opinion, considered themselves to be non-Canaanite. Just after the Amarna period a new problem arose which was to trouble the Egyptian control of Canaan. Pharaoh Horemhab campaigned against Shasu (Egyptian = "wanderers") or living in nomadic pastoralist tribes, who had moved across the Jordan to threaten Egyptian trade through Galilee and Jezreel. Seti I (about 1290 BC) is said to have conquered these Shasu, Semitic nomads living just south and east of the Dead Sea, from the fortress of Taru to Ka-n-'-na. After the near collapse of the Battle of Kadesh, Ramesses II had to campaign vigorously in Canaan to maintain Egyptian power. Egyptian forces penetrated into Moab and Ammon, where a permanent fortress was established. After the collapse of the Levant under the Sea Peoples Ramesses III is said to have built a temple to the god Amen in Ka-n-'-na. This geographic name probably meant all of western Syria and Canaan, with Raphia, "the (first) city of the Ka-n-'-na, on the southwest boundary toward the desert. The Canaanites, with whom the Israelites came into contact during the conquest by Joshua and the period of the Judges, were a sophisticated agricultural and urban people. The name Canaan means "Land of Purple" (a purple dye was extracted from a murex shellfish found near the shores of Palestine). The Canaanites, a people who absorbed and assimilated the features of many cultures of the ancient Near East for at least 500 years before the Israelites entered their area of control, were the people who, as far as is known, invented the form of writing that became the alphabet, which, through the Greeks and Romans, was passed on to many cultures influenced by their successors-namely, the nations and peoples of Western civilization. 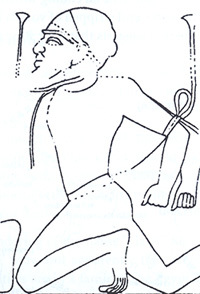 Even if not directly related with the Sea Peoples coalition the Egyptian records mention peoples referred to as Shasu (Egyptian = "wanderers"). These were largely or entirely a pastoral tribes, who had moved across the Jordan to threaten Egyptian trade through Galilee and Jezreel. Seti I (about 1290 BC) is said to have conquered these Shasu, Semitic nomads living just south and east of the Dead Sea, from the fortress of Taru to Ka-n-'-na. 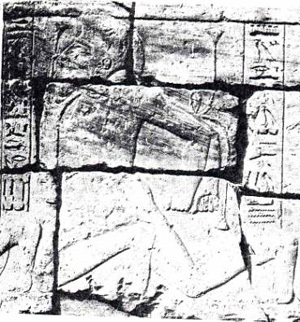 Egyptain temple reliefs profusely show Shasu, defeated by various Pharaohs. 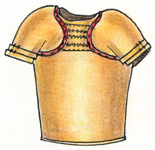 According to the illustrations, Shasu sometimes wear a simple pointed kilt and no upper garment. They are usually bearded, but the beard is less full than shown of settled Canaanites or Syrians. 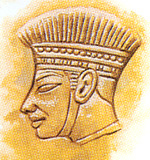 Hair is swept back and contained in a cloth wrap simililar to some "hedgehog" style helmet shown in the Late Achaean pottery (see also the page dedicated to the late helmets). A non stiff large helmet or turban is also worn by Shasu. 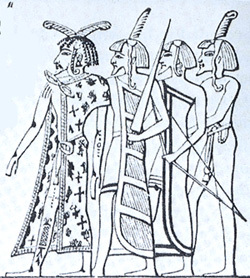 As the Egyptian illustrations are of military encounters, Shasu are often shown with their weapons. These consist of spear, bow sword (The swords shown are the curved variety, the scimitar favored by Egyptians) and round Hittite style shield with two lateral cuts. In the encounter between Ramesses II and the Hittites at Kadesh, certain Shasu were allied with the Hittites. Shasu also defended a city in Canaan against the Egyptians. It is no clear whether these Shasu were mercenaries, or whether there were bonds of clan affiliation and obligation between the and the inhabitants of those cities. Some archaeologists have proposed that Egyptian records of the 13th century BC are early written reports of a monotheistic belief in Yahweh noted among the nomadic Shasu. On a relief from Medinet Habu temple a captive Shasu is identified and represented between some other enemies defeated by Ramesses III. A couple of Shasu are clearly represented as recruited (together some Sherden) in the Pharaoh Ramesses III army. 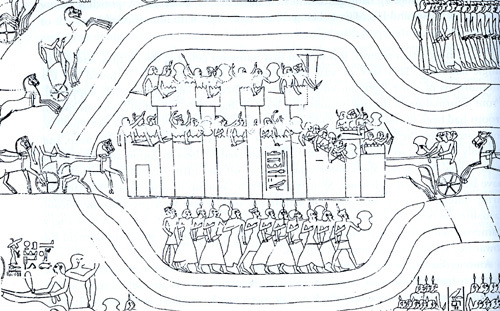 (*2) RAMESSES II's ACCOUNT OF THE BATTLE OF KADESH, REGNAL YEAR 5, C. 1285 BCE. Pp. 60-72 in Lichtheim, M Ancient Egyptian Literature. California; University of California Press 1976 . (*4) MEDINET HABU INSCRIPTIONS, REIGN OF RAMESSES III. Pp. 262-263 in Pritchard, J. Ancient Near Eastern Texts. New Jersey: Princeton University Press 1969. (*8) Dor (Kh. al-Burj or al-Tantura), is a large mound located on Israel's Mediterranean coast, about 30 km south of Haifa. (*9) A battle between the Phokaians the Tyrsenoi (Etruscan) and the Karkhedonioi (Carthaginians) is recorded in Herodotus' History, book I 166, in which we are told that battle was located in the so-called Sardonian sea. (*10) I Samuel 13, 19-23. For the distribution of iron objects in the eastern Mediterranean largely neglecting Anatolia, see Buchholz 1999: 710-11, Abb. 109-10. (*12) Papyrus Harris I, 77, 3-7. (*14) Even if still matter of debat a recent analysis conducted comparing the DNA of some peoples living from many generations in Tuscany area and peoples living along the coast of Turkey seem to support the Anatolian oringins of the Etruscan peoples.